Walla Walla has come of age as a wine region – that was the theme of last week’s column, with the Decanter World Wine Awards International Trophy received by Walla Walla pioneer L’Ecole No 41 for its 2011 Ferguson Vineyard red blend as prime evidence. The international recognition that L’Ecole has received is terrific, but it more than one reason to believe the region has really come into its own. 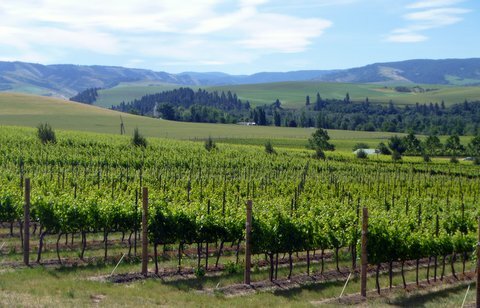 The dry farmed Yellow Bird vineyard in Mill Creek Valley is an example of a second terroir type — loess-draped foothills with fine-textured clay-rich soils and complex minerality derived from Missoula flood deposits. We also visited one of the vineyards that Chris Figgins has developed in this area and the estate vineyard of Walla Walla Vintners, too. The wines we tasted from this valley were savory and distinctive — different from what we tasted at Les Collines. 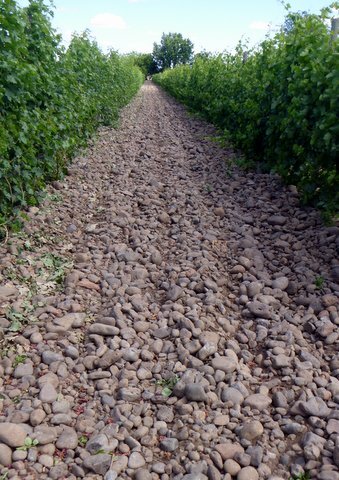 We visited “The Rocks” vineyard area in Milton-Freewater, Oregon to see the alluvial fan terroir and it sure was rocky! The rocks, built up over centuries are more than 100 feet deep. (One winery that draws fruit from this area calls itself Balboa. Rocky Balboa – get it?). 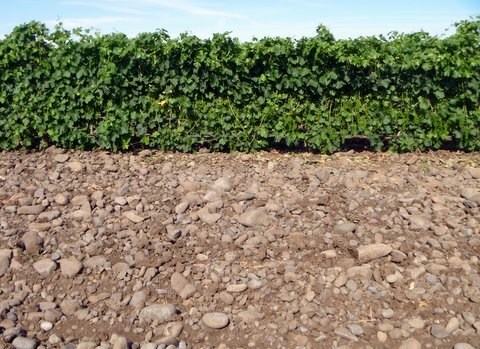 Walla Walla actually has two alluvial fan areas, this one on the Oregon side of the border that is planted with grapes and tree fruit and the other on the Washington side that, alas, is now pretty much completely covered by the city of Walla Walla itself. Damn! Hate to waste good vineyard potential that way! 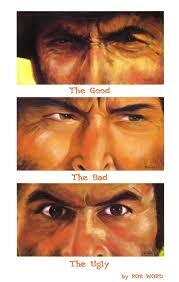 AVAs: Good, Bad or Ugly? The birth of a new AVA (American Viticultural Area) is generally greeted like the birth of a baby – a good thing, a cause for celebration. So a recent Wine Spectator article was somewhat bittersweet – it announced two successful births (Snipes Mountain AVA and Lake Chelan AVA – both in Washington State) and one failure. But I’m not sure that that “two cheers” is necessarily the right toast (and I found myself quoted to this effect in the Wine Spectator). My problem, I guess, is that I can’t stop thinking like an economist, even when it comes to good news like new AVAs. It isn’t that AVAs are bad, it is just that they are complicated and new AVAs produce both benefits, which are celebrated, and costs, which economists like me can’t seem to ignore. As I have said in a pervious post, the American Viticultural Area is an ill-defined concept. It is a geographic indicator, of course, telling the buyer that a high percentage of the grapes used to make a particular wine come from a specific geographic area, but its significance beyond that is unclear. An AVA doesn’t necessarily indicate a particular style of wine, for example, the way some European AOC rules do. AOC protocols often specify region, grape varieties, levels of ripeness and even the nature of particular blends that are permitted or sometimes required. Chianti is a region in Tuscany, for example, but it is also a recipe (albeit a flexible recipe) for the wines that carry that label. There can be great variation among wines from a given AOC, but the idea is that they represent variations on a theme rather than completely different wines. AVAs don’t necessarily define terroir either. Many AVAs are quite large and contain many different soil types and microclimates. The Napa Valley AVA, for example, encompasses rather different condition in the North than the South and on the hillsides and valley floor. The Columbia Valley AVA in Washington State takes this to the next level in terms of terroir diversity. It’s impossible to equate US AVAs with terroir. They’re just too big and there’s too much variability in all the physical parameters (soil, bedrock, climate, geomorphology). I had temperature monitors on Snipes Mountain (one of the smallest AVAs) during the growing season last year, and they showed huge variations in several important climate parameters. The top part of Snipes Mountain rises above the cold air pool that regularly forms in the Yakima Valley and so it’s much warmer and has a much longer growing season. 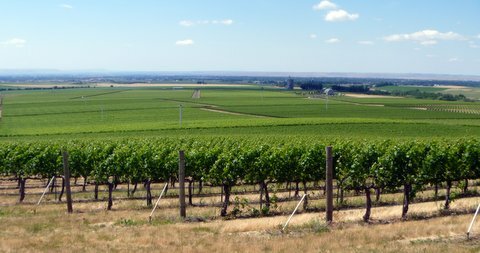 The Walla Walla AVA has at least 4 distinct soil terroirs and the average annual rainfall varies from 7 to 24 inches within its boundaries! While the viticultural idea of AVAs is ill-defined the economic idea of AVAs is relatively clear. AVAs are brands, but not the type of brands you are used to thinking of. Brands have a bad reputation among wine consumers because they are associated with insipid wines sold as package goods – Franzia, Yellow Tail, Two Buck Chuck. While these wines clearly serve a purpose in the marketplace and are obviously a satisfactory choice to the people who buy them, they are seen by wine enthusiasts as an insult to the concept of fine wine. They are industrial wine, not terroir wine, if you see what I mean. Economists don’t react so strongly to the idea of a brand, however. To us brands are just devices that producers use to send signals to buyers in markets with costly information. You may or may not like to eat at McDonalds, for example, but you know what to expect when you go there. Brands do the same thing for Budweiser, Coca Cola and Starbucks. Private brands do the same thing for wines if you think about Robert Mondavi, Clos du Val or Screaming Eagle. You have a good idea of what you are getting in terms of style and quality because producers invest in the brands to establish reputations. Having a well known and reliable brand is a great advantage in the marketplace. The main difference between private brands like these and AVAs is this: AVAs are communal brands. They don’t belong to any single producer but rather to anyone who sources grapes from the region. Hence the great difference in style that appears as different makers first seek the AVA designation to differentiate themselves from wineries in other areas and then further to differentiate themselves from other makers within the AVA. The result is not necessarily harmonious and so the AVA concept loses value to consumers. Essentially the problem is that the incentive to invest in the communal brand is ultimately weaker than the incentive to invest in the private brand once the AVA has been established. This makes sense since benefits from an improved communal brand must be shared while benefits from improving your own private brand are yours alone. The market significance of the AVA can quickly disappear. The problem gets worse as AVAs increase in number, making it more and more difficult for consumers to understand what qualities are associated with each. As I say in the Wine Spectator article, each new AVA benefits a small set of producers by giving them a new brand, but the collective result (the number of AVAs is now approaching 200) is in fact to reduce the significance of AVAs generally. I think it is possible that private brands gain market power as collective AVAs proliferate. And that’s exactly the opposite of what AVAs are supposed to do. I felt bad in raising my doubts about AVAs because I know and admire some of the winemakers in the new Lake Chelan AVA (especially Tsillan Cellars and Nefarious Cellars) and I didn’t want to rain on their parade. But I stopped feeling guilty when I discovered an article by A to Z Wineworks CEO Bill Hatcher on the Oregon Wine Press website. The continued proliferation of AVAs and sub-AVAs in Oregon, Bill says, isn’t good or even bad. It’s downright ugly! If the majority of Americans cannot point to Iraq on a world map, do we really expect them to pinpoint the Eola Hills or Chehalem Mountains, let alone deconstruct the subtleties between the two? 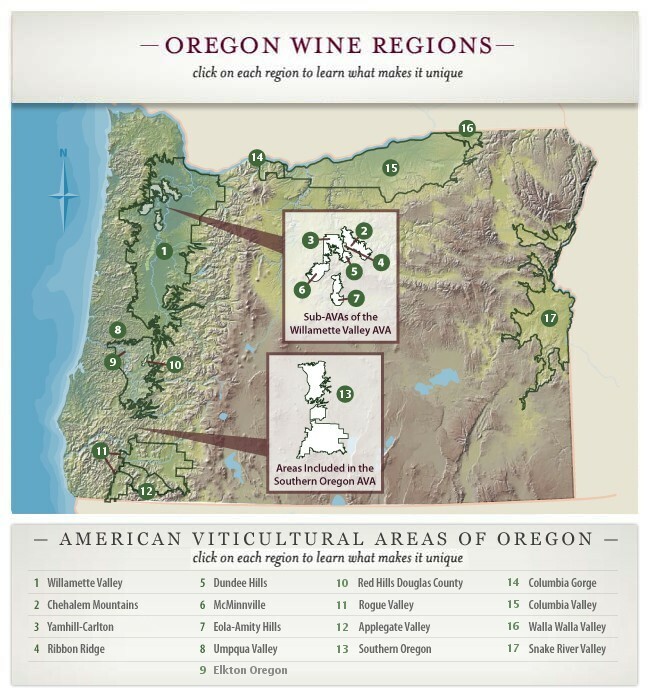 Further underscoring that presumptiveness, a recent study commissioned by the Oregon Wine Board revealed that over half the respondents in our target market were largely unfamiliar with Oregon as a wine-producing region. The sub-appellation movement reached absurdity with the Snake River AVA, containing one Oregon vineyard and no wineries, meaning that we had, in fact, finally parsed an appellation to someone’s backyard. The industry has come to be driven more by politics and narrow self-interest rather than collective marketing economics or common sense, a polemic we can no longer afford (if we ever could) in these precarious times. More than a few wineries will fail in the coming months and more than a few vineyards will not be harvested. This is not the time for intellectually bankrupt parlor debates as to whose soil is redder and whose vineyard practices are greener, but rather a time to unite and underwrite the commonwealth of Oregon. The economic crisis is likely to intensify the tension between narrow and encompassing interests and between private and communal brands. The strong are likely to get stronger in this environment, I think, and as Bill Hatcher suggests, some of the weak will fade away.